We are a little more than 3 months into 2018 and have seen some drastic changes when it comes to social media. Almost every major platform has changed its algorithm which has marketers, entrepreneurs, and businesses scrambling to figure out what the new social media marketing system is and how to automate it. What was working in 2017 has come to a screeching halt due to regular algorithm changes. This is why I believe video will be more important than ever to your social media marketing plan in 2018. The one thing that does all three of the above, is video. People love to watch video, comment on it, react to it, engage with it and engage with other views. The exact formula the social media platforms want. The more you use video, the more you will be rewarded with exposure by the social media platforms. Before you get started with video in your social media marketing strategy, understand that not all video is created equal. 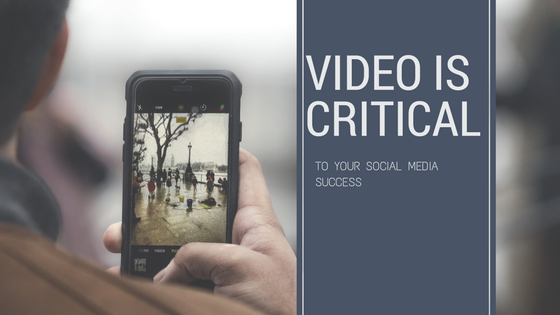 Before you can understand how video is weighed, you must recognize the 4 main types of video you can use on your social media accounts. Each social media platform or channel views video differently and gives each type of video a score within its algorithm. But, if I were to rank the various types of video, I would say the following pecking order would work well to get you the most exposure. Why this particular order? In a word…ENGAGEMENT. Engagement is always going to be the key in any algorithm. The more people engage with a post, whether it be a photo, text, or video, the more weight it will carry. Engagement tells the social media platform how important the post is to people. If it has a very high engagement rate, the social media platform will give it more exposure. Live video – While a live video may not have viewers at all at the start of the broadcast, the social channel will invite audiences or people you don’t even know to help you get more viewers. The fact that viewers can have a conversation with the broadcaster through the comment section adds to the engagement rate. The more the audience engages with the broadcaster, the popular the video becomes. Additionally, those who take the time to watch a video on the “replay” tell the social platform that the content is important and desirable. Pre-recorded video – This type of video doesn’t have the same allure or sense of urgency as live or “FOMO” video may have which causes it to carry less weight. Animated video – While this type of animation or video may capture someone’s attention or “stop the social screen scroll,” it does not compel people to interact with the content as much as a live video or disappearing video might. When creating a video marketing plan for your business, take the time to evaluate all the types of video you can use. Create a plan that incorporates all types of video mentioned above so that your social channel is interesting, fresh, and exciting. Above all, stay consistent with your plan. This is where most social accounts fail – lack of consistent content made available to their audiences. ~ Have a profitable week.